Hearing impairment is the partial or total inability to hear in one or both ears. People with mild hearing loss may use a hearing aid. People with more sever hearing loss may depend on lip reading and those with profound deafness may use sign language as well. Some people with profound or severe hearing impairment may have a cochlear implant. This is different to a hearing aid, which amplifies sound, as it functions as the damaged part of the inner ear to send sound signals to the brain. These work better than hearing aids because they can allow people to hear better, focus better in noisy environments and hear and talk on the phone. There are many causes of hearing impairment. Some people are born Deaf and others lose their hearing later in life. Some diseases such as Meningitis, Lyme Disease and Diabetes can cause hearing loss. Other people may develop it through circumstances such as exposure to loud noises or head injuries. It is important that you do not speak until the Deaf person is looking at you so try to get their attention before starting to talk to them. If they are busy doing something, wait until they have finished and are ready to look at you. Make sure you have eye contact. Some Deaf people are able to lip read so they will need to be able to see your mouth in order to do this. Over-exaggerate lip movements and talk at a good speed, not too quickly or slowly. Do not turn around, turn away or look down. Always make sure they can see your face clearly. You will also need to stand an appropriate distance away for lip reading. Make sure the environment you are in is not too noisy as this could make it harder for hearing aid users to hear you. Also, make sure you are not standing in front of a bright light as this could make it harder for a Deaf person to read your lips. Check every so often that the Deaf person has understood you. If they have not understood you, try repeating or rephrasing what you have just said. It is more difficult to lipread a single syllable word so if you need to repeat or rephrase, try using a multisyllabic word instead. If you know some sign language then use it when communicating with a Deaf person. It does not matter if you are not proficient or make mistakes, they will appreciate your efforts. As a last resort you can write down what you wish to tell them. Do not be afraid to do this if necessary. Writing or drawing can be a great way to aid communication. As long as you get your message across, it does not matter too much how you did it. 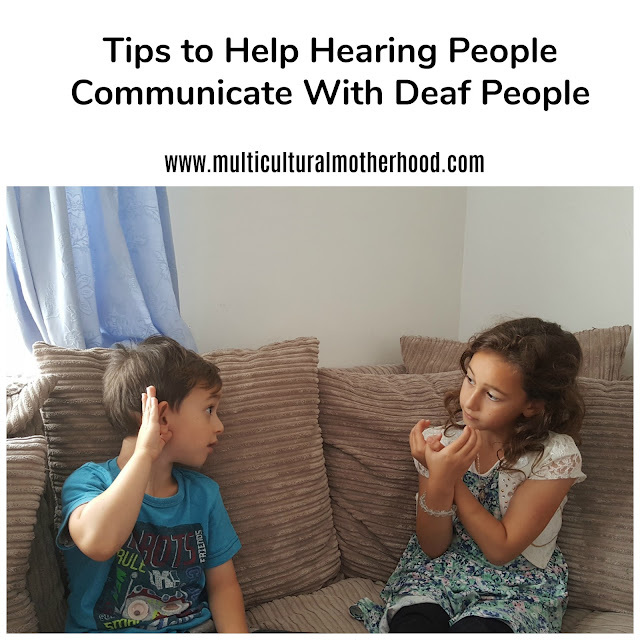 I hope these tips will help you to communicate with people with hearing impairment. Take a look at this article for your chance to WIN a copy of the amazing new book A-Z of Islamic Signs in BSL.